Share what's good in your life and organization. Here's a brief testimonial of how customers, fans and followers will engage with you more than you may realize when you share "for good" stories. In today’s presentation published at Target Marketing, we share our top 15 online video test ideas. If you haven’t tried video yet, consider this a nudge for you to reinvent yourmarketing approach and broaden your direct marketing skill set. And on the subject of reinventing skills, in few moments we’ll share with you exciting news about an evolution of this blog and how we plan to introduce you to topics that go beyond video marketing. We put our heads together and came up with a list of the top 15 online video marketing initiatives that we recommend you test as we move toward the important fourth quarter sales cycle. So let’s get right into the list. 1. Create, or update, a video with a personal guarantee direct from your CEO and share it on your website, promote it in an email to your customers, and post it on YouTube. 2. Make it a point to interview three satisfied customers, then build your video archives with new videos of customers and their testimonials added at the rate of at least one every month. 3. Create a video that demonstrates how your product is made, or how it works. And don’t forget a call-to-action to buy it! 4. Create a series of videos that give your customers or fans a behind-the-scenes look at your product or people. 5. Send an email to your customer list announcing your series of videos and make sure you tell them to watch for more videos in the series to get the complete story. 6. You can contact your email list with purpose, and more frequently with video, so test a campaign with a series of videos where you send weekly emails for a few weeks. Then, evaluate open and click-through rates to see how video works for you in email marketing. 7. Include the word “video” in your subject line. Testing has shown that this alone can increase open rates. See for yourself, by conducting a simple A/B split test, using “video” in your subject line of one version versus an email without the word “video” in the subject line of the other version. 8. Video is proven to increase social media engagement, so include video in your social media postings and encourage your fans to share it with their friends. Ask viewers to “like” your video, so you encourage social signals and build followers to your YouTube channel. 9. Consider an email opt-in campaign where you create a short video that introduces the story, but for the viewer to get the rest of the story, they have to opt-in for the follow-up video. With this approach, you will add opt-in email addresses to your list, and verify who is truly interested in your product or service. 10. Test a pay-per-click campaign with the enticement to watch a free informational video. This is another opportunity to create a landing page with a short video, and the invitation to opt-in with an email address for the remaining videos in the campaign. Just remember: don’t jump to the sales pitch too quickly. 11. Create a YouTube channel if you haven’t already, and make sure you optimize it with keywords in the title, in the description, and don’t forget to include tags, and include a transcript of your video on YouTube so the words appear in closed-captioning. Not only are you including people who may be hearing impaired, you’ll help YouTube categorize the content of your video with keywords. 12. Test video advertising in display or text ads on YouTube, and test a 30-second pre-roll ad on long-form videos on YouTube. 13. Test video length. You’ve heard us say time and time again that you must keep your video tight. Viewers will stick with you as long as the story is well told, tightly edited, and with the promise there will be something great at the end that makes it worthwhile to watch the entire video. 14. Create a video sales letter where you convert the copy of a long-form direct mail package to a video, using words on screen and voice-over. 15. Carve out a percentage of your budget to test video. Any smart direct marketer knows that a percentage of every budget should include testing of some type. In the direct mail world, you probably set aside a percentage of your budget to test new lists and new creative. We encourage you to allocate a part of your budget to test video, as well. On the subject of budgets, consider allocating a part of your budget to engage in tests of new forms of online media to reach your prospects and customers. As I mentioned at the beginning, our blog is evolving and expanding to encompass many of those oftentimes puzzling new online direct marketing opportunities. We’re long-time direct marketers. I started in direct marketing in 1978, when we didn’t have personal computers to crunch numbers in spreadsheets, writing copy was done on a Selectric typewriter, making it a challenge to edit, and graphic design was done with pen and ink, line rule tape, transfer type, wax, and rubber cement. So we’ve been there and know how challenging it is to change. ... along with additional subjects that we, as long-time direct marketers, believe you should understand and consider testing. So starting in a couple of weeks we begin a new blog named Reinventing Direct. We’ll discuss new ideas, how direct marketers could apply these opportunities, and break it down for you in non-threatening, practical ways so you can better understand it and reinvent your direct marketing skills. We’ve been in your shoes. We, too, are continually learning, or reinventing, how we solve marketing challenges. We hope you’ll follow us on our new blog, and we invite you to suggest topics in the comments area below, or email me directly with your thoughts. On behalf of my co-author, Perry Alexander, it’s been our pleasure to have authored Online Video Marketing Deep Dive. Thank you for being a loyal follower and we look forward to sharing our tips with you soon when we launch Reinventing Direct. In today’s presentation, we discuss using YouTube’s TrueView video ads,and how by growing viewership of your ads, you can use remarketing tracking to build a prospect list and bring viewers back to your video marketing message. If you’re familiar with Google Adwords, this is a logical progression in expanding your direct response media choices. With remarketing, also known as remessaging or retargeting, you have the opportunity to show text or display ads to promote your video to millions of viewers based on their past interactions with your videos or on your YouTube channel. By reinforcing your message with people who have already seen your videos you’re more likely to succeed in building your list, generating leads, or making a sale. AdWords for video is a video-specific campaign management tool within Google AdWords. It offers an advertising program called TrueView. Within TrueView are a few video ad formats to choose from, all priced on a cost-per-view, or CPV, basis. With TrueView ads, you only pay when a viewer actively selects your video, or chooses to continue watching a video when it first loads as they browse video content. 1. In-Stream Video ads. Use this format when you have video content you’d like to promote before short or long-form videos. You might think of this as a pre-roll ad, and they appear on the video. The viewer has the option to skip the ad, but you’re only charged when the viewer reaches the 30 second point of the video. 2. In-Search Video ads. These were previously known as YouTube Promoted Videos. This format lets you promote a video using a text ad that includes your video’s thumbnail image, above or below search results on YouTube. You’re only charged when viewers begin to watch your video. 3. In-display video ads. These ads appear alongside other YouTube videos, or on websites in the Google Display Network. You’re only charged when viewers choose to watch your ad. When you run a video ad campaign on YouTube, you also have the opportunity to create a video remarketing campaign. Remarketing lets you show ads to users who've previously visited your website as they browse the Web. And remarketing is a powerful way to stay engaged with your target audience. Remarketing lists are created by linking your YouTube account to your AdWords for video account. When you link these accounts, lists are automatically created that collect channel viewers, channel subscribers, and channel visitors for you. These were warm prospects at one point, and with remarketing, you have an opportunity to engage them again. 1. People who watch any of your videos. 2. People who take an action, such as liking, disliking, commenting, or sharing of your videos. 3. People who view your video as a TrueView in-stream ad. 4. And people who visit or subscribe to your YouTube channel. You can then use these lists of viewers within your targeting settings for new or existing video campaigns. First, you can improve ROI: Direct marketers who use remarketing on YouTube can improve return on investment by reaching back to customers or prospects who have demonstrated an interest in your product or service. Second, your YouTube video can generate a high number of views, sometimes quite quickly, by allowing you to reconnect with potential customers on your remarketing list sooner than with other remarketing methods. Third, you get efficient pricing. The AdWords auction model offers competitive rates that meet your target ROI. You pay only when the user chooses to watch the ad, known as cost per view. Fourth, enjoy flexibility: most remarketing relies on users visiting an advertiser’s website. Now, with AdWords for video and YouTube, you can remarket based on actions specific to your YouTube videos, including when viewers like, dislike, comment on, and share your video. Additional features of video remarketing include your ability to market to your potential customers by using specific categories, such as topics, interests, keywords, geo-targeting, and more. As a direct marketer, you’ll want to see reports. You’re in charge of optimizing your remarketing campaign based on performance metrics. For example, you can raise bids on specific topics or channels that generate the greatest response for you. There is one caveat before you can start a remarketing campaign. Your video or channel must have interactions from a minimum of 100 viewers to meet the remarketing list criteria before the video remarketing list can be added to a targeting group. Most likely, you can get those 100 interactions by sending an email to your customer list, or promoting your video on social media, and ask your followers to watch the video, or subscribe to your channel. Clearly there is much more to this video marketing opportunity than can be included in today’s presentation, so I encourage you to checkout Adwords for Video from Google. In today’s presentation we’ll discuss how you can produce strong online video advertising using proven direct response broadcast techniques. I want to emphasize that today we’re talking online video advertising, not content videos. Video advertising is often what you see at the beginning of a video, called pre-roll, usually 30 seconds or longer. You’ll see advertising videos on YouTube and other video hosting sites. Sometimes video ads are placed in the midst of a long-form content video and are called mid-roll. Those can be short—as little as 10 to 15 seconds. Post-roll videos are placed at the end and are also usually 10 to 15 seconds. First, we’ll share with you five tips from Google’s Inside Adwords that can help you produce effective video ads that can work even with small budgets. Then we’ll look at seven classic direct response television advertising best practices. Google’s Inside Adwords makes a point of saying that the Internet gives everyone a voice. Small advertisers can get their message out at a fraction of the cost of broadcast television. Said another way, videos are as important to a company’s online presence as is your website. First, look at your starter image, also known as the poster or the thumbnail still shot. Its purpose is to entice the viewer to click play. Google suggests bold, vibrant colors, and to limit your text to a minimum. The deep dive for direct marketers is that it’s critical to craft the text in the poster image just as you would choose the teaser copy on a direct mail outer envelope. Second, tell story. You’ve heard us recommend this in our past blogs. For example, use a story involving people, whether it’s the company owner or customers. But, resist the temptation to develop your video using a product-based infomercial style. Your story’s purpose is to build trust and that you understand the viewer’s issue. Only then, can you focus on solutions. Third, it’s okay to use animation, but only if you have a complex idea. Otherwise it can easily end up being an expensive distraction to your story. Fourth, front-load your video with important messages, to get your pitch out early especially if you’re trying to keep your video short. And finally, number five, avoid scripts unless you’re hiring actors. Otherwise, scripts are stifling. Let the people on your video come across as authentic and credible. Get them to talk as if they were speaking with a new prospect, conversationally, with their own natural spoken rhythm. One more thing: keep mobile in mind as you create your video ads. Your video needs to come across clearly in the smaller screen of a smartphone. Now let’s turn to seven classic direct response television ad best practices that can give your video an edge over other advertisers. Number one, your video ad needs to instill a sense of immediacy. Viewers must feel that an opportunity will be lost if they don’t click to a landing page or call a toll-free number. Two, your offer must be clear. Your viewer must know exactly what they will receive from you. Three, your video offer is much more powerful if you’re able to state that your product isn’t available in retail stores. Four, positioned as a “web only or video offer only available a limited time,” builds on urgency and increases the value of the offer. Six, ask for a response early and often. Don’t wait until the final seconds. And seven, if you’re selling a product, demonstrate how it benefits the user, and turn it into a “how-to” message. Today, more than ever, direct marketers can embrace online video advertising, and you can test it with a small budget. When you use your proven direct response marketing techniques honed over the years to tap the power of online video ads, you’ll have an edge over your competition. In today's blog at Target Marketing Magazine, we’ll discuss what YouTube looks for in your video, as well as tips you can use to give your video a better shot at ranking higher in search results. With YouTube currently as the second largest search engine on the internet, with 1 billion unique monthly visitors watching YouTube videos, enabling your marketing videos to rank higher can lead to more people discovering you. It’s also important to point out that YouTube is the primary place you need upload your videos since the other players are small, and shrinking in their ability to attract organic search. Here are a dozen steps that marketers sometimes overlook that can enhance your video’s ranking on YouTube. 1. YouTube has a feature called Playlists that allows users to group videos into a single list or collection. If your video is added to someone’s Playlist, it can increase the power of your video to rank higher. Playlists can be interpreted as social signals about videos that are popular or valuable to YouTube users. Google is integrating social signals into its search algorithms, making it even more important to encourage interaction. 2. Build an authoritative YouTube channel. If your channel is new, don’t expect to have good rankings to start. But once you have an established channel with several videos and a growing list of subscribers, your videos will rank more highly in the search results. 3. Upload videos regularly. Videos in your channel which are updated regularly will help all of your videos rank higher. If you don’t upload videos regularly, your videos will lose rankings. Frequent uploading is seen to indicate relevance. 4. Respond to comments on YouTube in the first few hours after you publish a video. These first viewers are your core audience and building comments early helps increase the video’s ranking in search. 5. Total video views are another factor in your video ranking high. How do you get views for a new video you’ve posted? Announce it to your list or on social media. If you can, embed it on high traffic websites, or consider starting an inexpensive pay-per-click campaign to boost views. 6. Time watched on your video is important. Quality content will lengthen the time viewers watch your video.. Within YouTube analytics you can see bar charts that indicate at what point in your video your viewers drop off. Watch for that point on the analytics report to see what was said on your video that would result in a drop-off. 7. Annotations are another way to keep viewers on your video. You can include hyperlinks to other videos that are related to your topic, or playlists or your channel. 8. A new feature called “in video programming” enables you to showcase a thumbnail hyperlink to your most popular video. This helps extend time watched. Insert it just before the point where you lose your average viewer in your top videos. 9. A “like” on your video is a good thing. Consider asking viewers to “like,” it, and don’t forget to encourage likes in the text of your video’s description. 10. The number of places your video is embedded can enhance your ranking. Embed your video on your website, in a blog, an article, or even a press release. 11. Ask your viewers to share your video. That adds to social signals. If you email a link to your list, ask your readers to share it. If you post your video on social media, again, ask your followers to share it. 12. Ask viewers to become subscribers to your channel. One way to do that is to use annotations in your video asking viewers to subscribe. As a reminder, help your videos rank higher on YouTube using keywords, closed-captioning, incoming links and social signals. It's in this video, YouTube Video Search Rankings - 10 tips to improve results. Finally, if you have additional tips to add to this list of strategies to make videos rank higher on YouTube, please share them in the comments section below. There are several factors that will influence how your video will rank on YouTube, or if it will make the “related videos” or “recommended videos” list. Here are ten steps that you, the marketer, to do so your video can rank higher. 1. Your first action item should be to research keywords as you begin planning your video. Use Google Adwords for suggestions of keywords to reveal monthly traffic for specific phrases, and when practical, use those keywords as the basis for your video. 2. Be sure to look for the traffic of long-tail keywords, that is, keywords with at least three words that will be noticed by people who are drilling down more deeply into specific phrases. 3. Use those keywords and phrases in your video script. Google, who owns YouTube, has speech-to-text conversion technology. When you include keywords in your voiceover scripts, Google’s voice-to-text technology will pick them up and use them to rank your video in the YouTube search results. 4. Use those keywords in the file name of your video before you upload it to YouTube. 5. You can upload a transcript of your video voice-over for use with closed-captioning on YouTube. To upload a transcript file, click on Edit in your YouTube video manager. Click on the Captions tab. Under the Add New Captions or Transcript header, select Transcript File as the Type, upload your script and click “Sync.” When uploaded, click the CC button on the video and YouTube will display the words in exact sync with the audio. Bottom line: the transcript file with keywords and phrases will be used by the YouTube search engine to rank your video. 6. Use keywords in the title. Only about 55 or so characters are seen in YouTube search results so make sure your keywords appear at the beginning of your title. And challenge your direct marketing copywriting skills and write your title like a headline. 7. Use keywords in tags. Use as many relevant keywords as you can. 8. Use keywords in the description of your video. The more words you include in your description, the higher your chances are of your video being discovered. You have up to 5,000 characters you can fill, but be careful about repeating your primary keywords too often so you don’t get banned for spam. And of course, include links in the description back to your website. It’s better to start your link with http-colon-slash-slash than www. 9. Generate incoming links to your videos, so make sure links appear in articles, blog posts, forums, and most definitely, in social media. 10. Encourage social signals. Your video’s search rank will benefit from comments, favorites, and likes. To attract these social signals, you’ll need to create a high-quality video and ask people to take those actions on it. In our next blog, we’ll discuss what YouTube looks for in your video and several other often overlooked tactics that are used to decide how high your video should rank in search results, so be sure to watch for it to get the full story about how to help your video rank higher in YouTube search. In today’s presentation at Target Marketing Magazine, we give you the wrap-up of our test of short video clips that were used to promote shows for a performing arts organization. You may recall that we assured you early on that we’d let you know if it was a success or a bust. So, let’s get right into the results. You may recall that this test was inspired several weeks ago by Twitter’s release of Vine, a social media platform where six-second video clips are posted. We decided to test this short video format in a name that tune contest to see if it would move the needle on ticket sales. During the past several weeks, we’ve shared with you a few twists and turns in the road. Learning number one was that six-seconds simply isn’t long enough to produce what we considered for our purposes to be a meaningful video. As a result, we adapted the format of the five short video clips to a length of 18 to 38 seconds each. Learning number two was if we wanted to use promoted posts on Facebook, we had to have a thumbnail image with less than 20 percent of text. That required using Vimeo over YouTube, because YouTube only allows custom thumbnails if you choose monetization of your videos. We tried that, and determined it was distracting from our message. Learning number three was that the engagement is different based on three different styles of videos we have used. Our longer form music videos resulted in the highest percentage of likes, comments and shares. The short video clips had about half the level of engagement, suggesting that at least for this organization, short video isn’t enough to sustain ongoing interest. Regarding the short video clip format test, my conclusion is this: I’m glad we did it. The test certainly didn’t hurt us. But I’m not convinced that short videos pushed sales, and I don’t know that I would do it again. Here’s why: in our video format mix for this show, we also produced a behind-the-curtain video. It was four and a half minutes and featured a preview of the show, along with interviews with a director, song arranger and soloist and several seconds of the soundtracks of a few new songs. That video, like those we have used for past shows, resulted in double the views over the short video clips. Other metrics you may be interested in knowing about is how our emailed patrons responded to a series weekly messages. The first five emails featuring the short video clips had strong open rates initially with a gradual decline after five weeks. Click through rates gradually declined as well, suggesting that interest waned with the short video clips. The behind the curtain video email that was sent a week after the short video clip contest ended experienced a click-through rate that was about 50 percent higher than emails featuring a short video. This suggests that once the patron saw that the video was a behind the curtain format, and wasn’t any more of the short video clips, their interest was renewed and they watched the longer form video. What does this tell us? Our fans like longer videos with more meaty content. That’s what gets our emails opened and clicks to our landing page, and generates the best engagement on social media. And that’s how we’ll promote the next performances. Because of deadlines for producing this video, I can’t tell you the exact ticket sales performance except to say it’s trending at about the same rate as a year ago. Unfortunately, because we couldn’t confidently A / B split test, we won’t know the impact short videos had on ticket sales. But, we know that video works for this organization, as evidenced by the 20 percent increase in ticket sales last Christmas, and the fact that we experienced this level of sales increase in light of all radio advertising having been cancelled. We’re committed to video as the central delivery vehicle for promoting this organization’s performances. Finally, the reality in marketing is this: you must dig into the numbers and analyze results, every step along the way. And, you must test new approaches. You won’t always hit a home run. But sometimes you have to venture out of your comfort zone to discover would could be the next big marketing opportunity for you. In today’s blog presentation we describe how we resolved a problem we had with our short clip videos on Facebook. An issue came up for first video when we posted it on Facebook. Fortunately, there are options and we figured out how to fix the issue for our second video. This is learning that will be important to you if you plan to post videos on Facebook and use promoted posts and pay-per-click advertising to generate more traffic to thevideo. For our first video in our Name That Tune contest, we posted it to YouTube, and then used the YouTube link on our Facebook fan page. Then I selected the “promote” option. When you do, you are given the option of promoting the post to people who like your page. Or, for greater reach, you can choose people who like your page and their friends. You set the budget which is directly related to the estimated reach. For $20 we can reach between one thousand to two thousand people who are friends of people who like our page. It’s an inexpensive way, at least in absolute dollars, to reach the friends of our existing fans. Friends of people who already like our page are probably the type of people who could become fans of our organization, and someday come to a performance, purchase a recording, or maybe even make a contribution. We have used promoted posts in the past. Based on our use of promoted posts last Christmas, and the fact that Christmas show ticket sales were up 20 percent over a year earlier, we believe those promoted posts contributed to the sales increase, and we certainly know that using promoted posts grew our number of fans. So when I posted our first video in this series for the Spring Shows, I used the promoted post option as I’ve done several times before. But this time, a few hours later I received an email notification from Facebook that the promoted post wasn’t approved. While there are several reasons why a promoted post may not be approved, we narrowed the list down to one likely culprit: the text in the still frame, or “thumbnail” image, that YouTube had pre-selected. That frame occupied more than 20 percent of total image. Facebook wants 80 percent or more of the image to be a photograph or other graphic treatment. Our video still image, which we had no control in selecting on YouTube, exceeded the 20 percent limit. Please understand that Facebook still included the video on our page and it was visible and played for our fans, but it meant our post would not be promoted to friends of fans. Unfortunately, by the time I learned the Facebook promoted post hadn’t been approved, we already had several comments on Facebook which were considered entries in the contest. Attempting to change it would have triggered other problems. So while Facebook wouldn’t approve the promoted post, and it’s clear in their Terms and Advertising Guidelines that they wouldn’t, it was YouTube that we had to work around. You see, when you post a video on YouTube, you are given the choice of one of three frames that you choose as the frozen frame image visible on YouTube, Facebook, or wherever else you post it. It’s really the luck of the draw if you get a frame that looks good. That’s why when you see the image of me hidden behind the Play button here on this blog, sometimes it shows me with my mouth open or some other less-than-flattering pose. By the way, we should note that YouTube is currently testing with a few users the ability to choose the exact frame they want as their thumbnail image. The inability to choose an exact frame for the still image on YouTube creates a potential issue when you want to promote your posts on Facebook. If all three of the frame options from YouTube have more than 20 percent of text on them, you probably won’t be able to promote your post on Facebook. Thankfully there is an alternative in Vimeo. Vimeo allows the user to choose the exact frame from the video you want to appear when the video isn’t playing. In fact, any JPG or other image file format can be uploaded and used, at your discretion. So for our second video, when Perry edited it, he created frames where the text was less than 20 percent of the image. We loaded it on Vimeo, selected the frame with less than 20 percent as text and posted that version. Facebook approved the promoted post, which enabled us to also create a pay-per-click advertising program. In the meantime, the video was also posted on YouTube which we use for the video on our landing page. While hosting the videos in two places is a bit inconvenient, one good outcome of the separation is that we will be able to analyze views on Vimeo, which we know will all come from Facebook, versus views on YouTube that will be from our landing page. There are pros and cons for both YouTube and Vimeo. YouTube is the second largest search engine on the planet right now. The analytics on YouTube are outstanding, giving you audience retention, demographics, and much more. But with YouTube, there is a lack of flexibility, at least for now, for most users, on the still frame that you can choose. Vimeo also has good analytics in terms of views, but not audience retention, demographics and other data. But on the positive side for Vimeo, you choose your frame and that’s a big plus if you plan to promote your video on Facebook. Vimeo offers other flexibility, as well. Before we close, we did want to give you a quick update on our response to the Name That Tune video series so far. I can tell you the campaign has generated significant interest from fans. The first videos have each had over a thousand views within hours and generated a lot of traffic to both Facebook and our web landing page. People are commenting and talking about the contest, all building interest in the days leading up to the show when momentum kicks in and we expect to see ticket sales pick up significantly. That’s when we’ll find out if this idea really worked. We’re pioneering here and don’t claim to have all of the answers. But we’re able to test, share our experiences like our glitch on Facebook and how to resolve those issues, along with results, whether good or bad. Through this process we hope to give you the confidence to test this approach for your organization. A couple of weeks ago, we told you about our plan to create a series of micro videos, inspired by the recent introduction of Vine by Twitter. As you recall, Vine enables users to record six-second short video clips and post them for followers to watch. The campaign started last week and it will continue until early April. When we’re further into the campaign, we’ll start to share results. Our blog from Target Marketing Magazine reveals three critical steps that had to be completed before we could possibly begin the campaign. Those steps were, first, to create a plan, second, write the official contest rules, and third, determine the production format for our videos. For the plan, we settled on creating five videos, released one per week. We’ll post the videos on YouTube, Facebook, and a dedicated web landing page where fans can post their guess of the name of the song in the comment section. To encourage participation, we’ll give away a limited edition, boxed set of CDs that have a retail value of $65. We’ll also give away souvenir CDs from the show. Since we are posting the videos on YouTube, Facebook, and our landing page, there are no limitations on the length of a video. In this video, you’ll see the first micro social video we created. We’re pioneering, here, and don’t have all the answers. If you’d like to follow along with the contest, you’re invited to like our Facebook fan page or check out the web landing page. In a couple of weeks, we’ll share with you another update. We hope this inspires you to go out and try something like this for your organization so that we can all learn and profit together. Starting an online video series can be daunting. But break it down with direct mail copywriting formulas and it will be easier to start. From our blog at Target Marketing Magazine we share how to create a framework for video series along with direct mail formulas for your script to close the sale. When you have a long story to tell, segment it into a framework. It makes it easier for your customer or prospect to follow you. It also engages the audience and can lead them to a decision to take action. Perhaps you’re familiar with the direct mail copywriting formula called AIDA. The A, in AIDA, is for Attention or Awareness, that is, to attract the Attention of the customer. I is for Interest, to raise customer interest by focusing on and demonstrating advantages and benefits. A for Action, where you’ve lead your customer towards taking action and purchase. Using AIDA, ho here are three steps you can take to shape your story, followed by closing tips to bring your video viewer to purchase. First, divide your story into pieces, or chapters, with a mission and purpose for each individual message. This becomes your framework. Second, determine the most important aspect of each chapter. Help the viewer learn and see the information as education. And third, your final video is your moment of truth. By the time you get to the last video in a series, use classic direct marketing closing techniques to close the sale. Watch this video for additional tips about how to close the sale, all based on direct mail best practices. Change is one thing that’s constant, and today we share with you how you can change the results of email marketing and social media results. Find out in this video from our blog at Target Marketing Magazine how we transformed an email and social media marketing campaign. Sales increased 20% using a strategy centered around purpose, frequency, and free content marketing. Successful direct marketing should have purpose every time you reach out to connect with your installed base of customers or followers. A campaign that has purpose gives you permission for frequency. We were fearful that frequency might result in email open and click-through declining. But the opposite happened. Followers looked forward to the next email or social media post. Open and click-through rates increased substantially and those levels were maintained throughout the campaign. Social media engagement soared because frequent posts meant friends shared the video with their friends. The third key concept is a change in thinking. Over the years, we’ve always known that an offer of “free with purchase,” would increase response. Today we challenge you to shift “free with purchase,” to simply “free.” You may have heard it referred to as “content marketing.” Giving content away invites a prospective customer to build trust in you. Watch the video to learn more about how we increased sales by 20% for this organization with a strategy of purpose, frequency, and free. 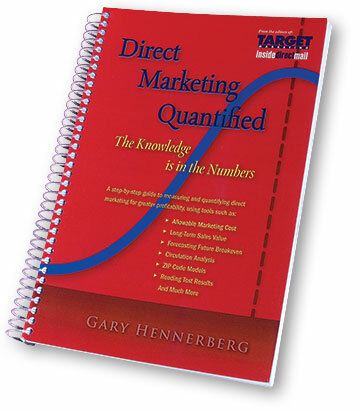 For direct marketers, there can be nothing more foundational than understanding the numbers, so that’s the topic of todays Online Video Marketing Deep Dive blog at Target Marketing Magazine. And as direct marketers, we like to pour over data. With YouTube, you have easy access to data and metrics that are a direct marketer’s dream. We’re going to show you several specific charts using examples from our own videos so you can see many of the analytic tools that are available. There two broad categories of reports from YouTube that you can use to evaluate your own videos. Those two categories are Views Reports and Engagement Reports. Today we’ll take a deeper dive into the Views Reports. Within Views Reports, you can drill down into five more reports that include Views, Demographics, Playback locations, Traffic Sources, and Audience Retention. Let’s look at each of these one-by-one. When you log into your YouTube account, click on a specific video that you wish to evaluate, then click on the Analytics link at the top right. On the left side, under the word “Overview” you’ll see a list of reports. First, let me point out a couple of things before you start running reports and getting excited about the numbers. Here, in the upper right you’ll see that you can view your statistics by geography, with options for the entire world, regions of the world, and countries. You can also search your preferred date range, from the most recent 30 days, to the past 365 days, up to the lifetime of the video. You can also choose your own custom date range. Let’s take a look at a video that we originally posted in February of 2010. There are over two and a half years of data on this video, and over 6,100 views. As a direct marketer, you might think of views as an impression with the opportunity to have generated a lead or a sale. On the summary page, you can see several thumbnails of charts that give you an overview of the performance of this specific video. In addition to the number of views, you’ll see the total number of minutes it was watched, engagement information, demographics including top geographies and gender, along with the top playback locations and traffic sources. We’ll detail some of these one-by-one. Click on performance and you can see a chart that shows you views of the videos on a daily basis over time. With this information, as a direct marketer, you can better identify seasonality. Change your date field to the most recent 30 days, for example, and it becomes much more granular and easier to read. Using this more granular view, you can determine if there is a day of the week when you have more video views which could influence deployment of email or social media campaigns. You can also compare views to other metrics such as unique cookies, estimated minutes watched, and subscriber net changes. Demographics reveal the gender who watches your video, along with their ages. This chart also shows the top locations by country along with the age and gender of the viewer by country. As you can see in this example, 70% of viewers of this video are female, with the highest concentrations among ages 45 to 54, and most views come from the United States. We know in direct marketing that we want to reach specific audience niches. In this instance, you would know that your message should be decidedly female in orientation, and geared toward a Baby Boomer. When you view Playback locations, you get a sense of where the video is being played. In this example, 71% are played on YouTube’s individual page, which is the most common. Nearly 19% are viewed on Mobile devices. For direct marketers, this is important to understand. With a high mobile reach, it’s vital that your video be produced with tablets and iPads in mind. When you click on Embedded player on other websites, a new view appears that reveals where your video has been embedded (such as on your own website), and the traffic that came to YouTube from those other sites. This will help you pinpoint your most productive online direct marketing efforts. Now click on Traffic Sources and you get a whole new look at how your video was found. Finally, you can get audience retention statistics. This example is from a recent Online Video Marketing Deep Dive video. This view is of the Absolute Audience Retention, and it enables you to see the expected gradual decline in viewers as the video progresses. This is a 6:30 video and when you look at Absolute Audience Retention, it shows that about half of viewers who started the video stayed to the end. You can also see that at 3:30 and 4:00 minutes the viewership went up slightly, indicating that was a place where listeners rewound, and re-watched that segment of the video. Next, compare your video’s performance to other videos of similar length on YouTube, when you click the Relative Audience Retention tab. You can see the audience retention in this example was actually above average. Use this information to know where to edit your videos, or identify words or phrases that either enhance, or detract from, your retention. With these five reports, you can get a good understanding of how your video is performing, and what opportunities you have to improve your direct marketing initiatives. Finally, we had expected we could review the Playbook in a series of three videos. But what we’ve discovered is that there is so much material to be covered that we need to make a choice, and we’d like your input: would you prefer that we produce three long “deep dive” videos? Or would you prefer multiple short videos over the next several weeks? Please email us your opinion using the link in the text, or comment below. In addition, we’ve considered producing a set of videos that would take you deeper within YouTube analytics, and show you how those numbers can be used by direct marketers. If you would be interested in subscribing to an educational program like this, again, please use the email link on this page, or comment below, to let us know your thoughts. An online video is a marketing asset you can leverage time and time again. This post that I authored for Target Marketing Magazine discusses the product categories where consumers are most engaged in online video, the types of video they watch to learn about products, and finally where those videos are watched most by internet shoppers. This analysis is especially important if you’re a direct marketer who depends on strong sales during the fourth quarter of the calendar year. Armed with these insights, it’s not too late to get going and test online video yet this year. First, let’s review the product categories where consumers watch product videos. These statistics come from a report called Delivering Superior Shopping Experiences Via Video: Consumer Insights and Retail Execution sponsored by Invodo. Most likely, if you’re a consumer marketer, your category – or a related category – is on this list. The automotive category tops the list with 31% of internet users reporting that they’ve watched an online video. And why not? Bright shiny cars with product features that can be fully showcased, ultimately can seduce the viewer to want to buy now. Consumer electronics, another product category that can be compellingly romanced with a video, comes in at 30%. Online video is also hot for music, DVDs, toys and video games. Computer hardware and software, which is both a consumer and business-to-business category, can be humanized with online video. And then there is food and wine, apparel, health and beauty, furniture, sporting goods, crafts, and much more (be sure to watch the video for the detailed numbers). It’s clear that when your customers have access to an online video, they are watching it, and when done properly, they’re taking action and buying. In that regard, video becomes an asset for marketing your product. Viewed as a marketing asset, a video has the ability to be posted online for as long as you wish to generate future sales. The second study comes from Google and Compete.com, and it was released in July, 2012. This research concerned online shoppers for apparel, but I think you’ll quickly see how the findings can apply across many consumer marketing categories. What’s so important is the variety of types of video that can be created to attract qualified viewers and drive customers to you. The number one type of video that shoppers watched was customer testimonials and reviews. Over one-third of shoppers watched what others said about products. Clearly it’s vital that you include customer testimonials and reviews at every opportunity. Next was email marketing videos at 29 percent, establishing once again that email is a vital component to drive traffic to videos that feature your product. Other video categories included consumer-generated video, ads that appear elsewhere online, ads that appear while watching content on a TV network website, and professional reviews. So while you might think that video is limited to demonstrating a product, think again. Prospective buyers want to hear from others who’ve purchased or experienced your product. They click on links in emails or on ads. They want to hear reviews from professionals, and they’ll search online for more other videos to become better educated and compare. The Invodo study reveals another important insight about the websites where internet users watch product videos. Not surprisingly, just over half of users watch videos on a website’s home page, which clearly confirms the importance of including a video in this hot spot. Product pages closely follow, followed by brand pages, category pages, customer service, and frequently asked questions. What consumers didn’t report, because they may not have known the term, is how often they say they view videos on landing pages. These are the specific pages that an email links to where the video is embedded. More about the importance of video landing pages in a future post.